Argus Valves – As a standard, ARGUS ball valves have dual spindle seals, which ensure optimum resistance to leakage under even the severest conditions while offering versatility across widely differing applications. 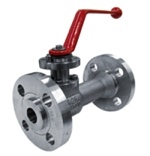 Since 1948, ARGUS high-quality ball valves have been used in control and transport systems in the process and gas distribution industries. The name ARGUS stands for technical sophistication and the highest quality standards. ARGUS ball valves are designed to fulfill all international requirements and comply with API 6 D, ANSI B 16.34, BS 5351 and DIN 3357.